Ig Vella's Dry Jack Cheese for sale. Buy online at Zingerman's Mail Order. Gourmet Gifts. Food Gifts. In all my travels, I've never met anyone like Ig Vella and I've never tasted cheese like his Dry Jack. Each is an iconoclast. 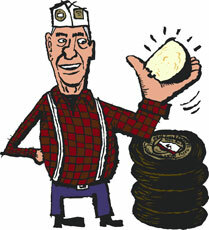 A wedge of his flagship cheese has more character than a bushel full of industrial "Monterey Jack" imitations. Dry Jack combines the crumbliness of Parmigiano-Reggiano and the butteriness of well-aged cheddar into a single, golden chunk. This is a cheese I come back to again and again, and each time is a revelation. It keeps a long time, too.